DELHI, India, October 14, 2013 (ENS) – Cyclone Phailin is weakening today after it made landfall on the coast of eastern India late Saturday, yet heavy rains are still falling – hardest hit were the states of Odisha, Andhra Pradesh, Jharkhand and West Bengal and the Andaman and Nicobar Islands. The cyclone and the flooding it caused have claimed 28 lives and prompted India’s biggest evacuation in 23 years. More than 900,000 people were relocated from the coasts of Odisha and Andhra Pradesh to shelters in safer places inland such as schools, government offices, and purpose-built cyclone shelters. Officials say the high level of preparedness and massive relocation contributed to the low death toll. The last time a comparable cyclone hit the same area, in 1999, the death toll was close to 10,000. Moving across the Bay of Bengal on October 11, Phailin’s winds were equivalent to a Category 5 hurricane, the highest category on the Saffir-Simpson hurricane wind scale, blowing faster than 252 kilometers per hour (157 mph). 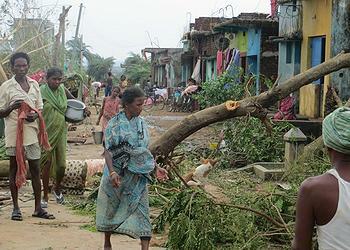 The cyclone started to weaken October 12 as it approached the Indian state of Odisha. The system made landfall later that day, near Gopalpur on the Odisha coast. The system has since weakened over land and shifted to the state of Jharkhand as it degenerates into an area of low pressure. India’s President Shri Pranab Mukherjee expressed sorrow over the tragic loss of lives and damage sustained due to the devastating storm. He congratulated the authorities on their high level of preparedness, which he said limited the damage caused by the cyclone, and called upon them to provide all possible help to the affected families through speedy relief and rehabilitation operations. Officials from Odisha’s state government say around 12 million people may be affected. 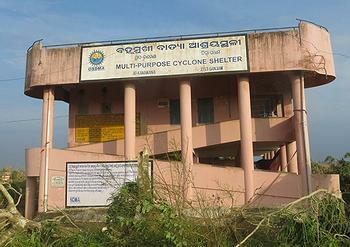 As part of the preparations, 600 buildings were identified as cyclone shelters and people were evacuated from areas near the coast, including Ganjam, Puri, Khordha and Jagatsinghapur districts in Odisha. The cyclone left a trail of flattened fields, uprooted trees and damaged power pylons. The power stayed on in most of Andhra Pradesh, but in Odisha, it was reduced to about 25 percent of normal. In a region where many live in homes made of palm leaves and tarps, thousands of houses and shops were blown away. The Orissa government estimates that more than 14,500 villages have been affected, and over 230,000 houses will have to be rehabilitated. India’s armed forces have been conducting rescue and relief operations on land, in the air and at sea. The Army has helped to clear the National Highway and other roads, enabling communication to be restored. They have relocated and moved towards Balasore, Ganjam and Jamshedpur to assist the state governments in flood relief operations. The Indian Air Force has positioned 44 of its elite Garud special forces and a rapid action medical team of 37 doctors and paramedics for similar rescue and relief measures. The Coast Guard managed to rescue 19 Chinese and one Indonesian crewmen of the sunken Panamanian ship MV Bingo near the Sagar Islands off the Odisha coast despite very rough seas. The Coast Guard also gave medical assistance to 18 fishermen who were washed ashore after jumping into the sea from their stranded boats off Paradip. At Chilka, Odisha divers from the Naval Training establishment helped villagers in the low-lying areas that were flooded due to torrential overnight rains. The Navy has moved two aircraft from Kochi to Bhubaneswar carrying rations and also moved 12 tons of rations from Visakhapatnam to Behrampur. Indian Navy divers were flown by helicopter for rescue efforts in flooded areas. The navy divers were airlifted to some of the worst affected areas north of Balasore and Chandipur. Chief Minister Naveen Patnaik visited the hard-hit Ganjam district today and informed Prime Minister Manmohan Singh of the post-cyclone conditions. The Prime Minister directed that all possible assistance should be extended to the state governments concerned in ensuring the safety and security of the people and in relief and rescue operations. The cyclone also caused damage in Thailand, Myanmar and Nepal.